Seventeen cats were brought to the Animal Protective Foundation in Glenville, New York on Tuesday morning by a Good Samaritan after being found abandoned on the side of the road in Schenectady. 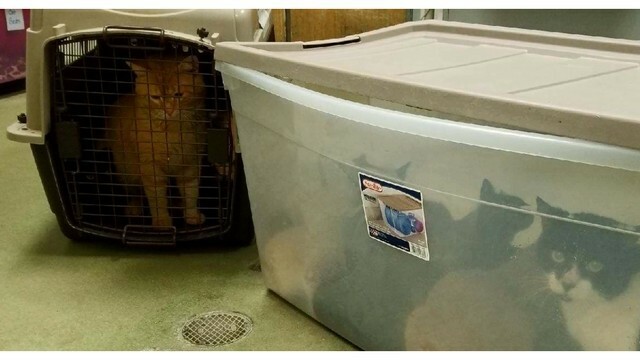 Amy Duskiewicz, the shelter director, said it’s unclear who abandoned the cats, But it’s very lucky they were found – the plastic container was sealed shut and airtight. The cats were covered in urine and feces and they all had fleas and ear mites. When they arrived at the shelter, Duskiewicz posted a video to Facebook. “Thankfully these folks found them and brought them to us to receive care, but, this puts us over capacity,” she said along with a plea for help. Duskiewicz says all the cats have been given exams and treatments. Despite the traumatic experience, she says they are doing OK. A few of the cats have already been put up for adoption. As for whoever left the cats on the side of the road, the shelter is working with the SPCA on an investigation. I can’t wait till they find out who did this! How sick and cruel can people be? I hope they’re found and get the book thrown at them!